“‘People about to kill themselves frequently engage in self-soothing behaviors,’ Dr. S. David Bernstein told The Huffington Post. Shopping sprees are definitely one of those behaviors, he said. ‘Spending — and giving things away — make us feel good,’ he said. 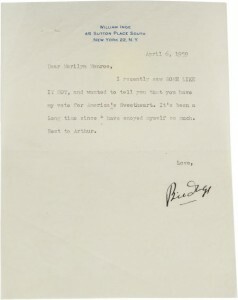 The check was signed by Marilyn, but written by someone else – possibly her housekeeper, Eunice Murray. 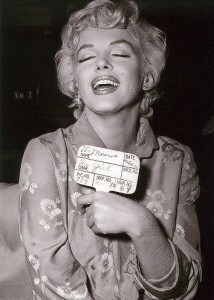 Personally, I don’t think this item tells us anything significant about Marilyn’s state of mind on that day. 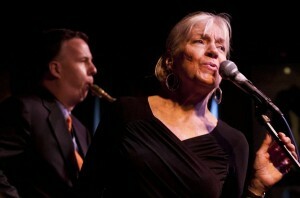 She had been purchasing furniture regularly since moving into a new house several months before. Veteran columnist Liz Smith considers the story in her latest Chicago Tribune column. Gentlemen Prefer Blondes will be screened at Eureka Main Library in Humboldt County on California’s North Coast, as part of a Book Film Series, tonight at 6.30 pm, reports the Times-Standard. 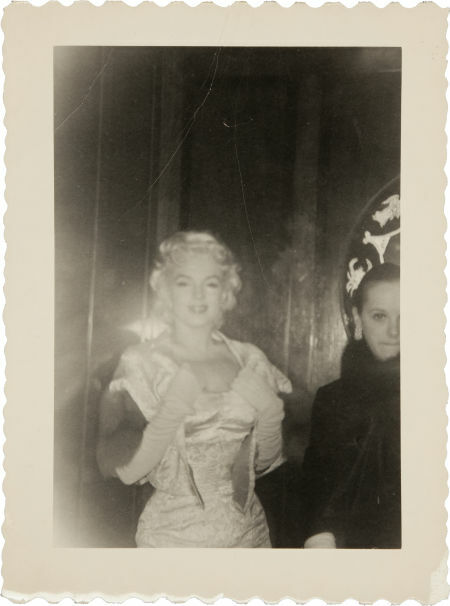 Christine Oates, the Liverpool-based designer of exquisite replica MM costumes, has spoken to blogger Aylon Ewing about her work. You can read the interview here. Patrick Ryan Frank was inspired by this 1955 photo to write a poem, ‘Marilyn Monroe and Truman Capote Dance’. You can read it, or download his recording here. His debut collection, How the Losers Love What’s Lost, is published by Four Way Books. 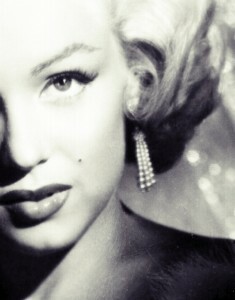 Four of Marilyn’s greatest comedies will be screened outdoors, in the shadow of the giant ‘Forever Marilyn’ statue in Palm Springs this summer, reports MyDesert.com. 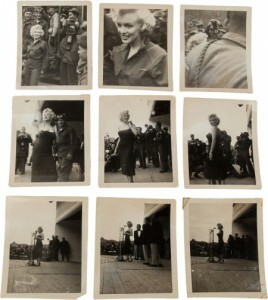 The Entertainment and Music Memorabilia Sale, organised by Heritage Auctions, will be held in Beverly Hills on July 24. Other Monroe-related items include a pink Pucci blouse, a note from playwright William Inge, and rare photos from Korea and the East of Eden premiere. 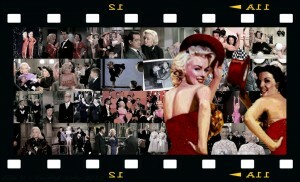 This month’s updates include a review of the great new book, Marilyn in Fashion; footage of director Howard Hawks talking about Marilyn; two magazine items from 1957; reporter Vernon Scott’s account of the famous ‘pool scene’ in Something’s Got to Give; and my profile of photographer Jean Howard. 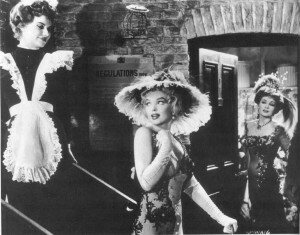 Jean Kent has spoken to Richard Kay of the Daily Mail about her bittersweet memories of working with Marilyn on The Prince and the Showgirl.